Should You Hire A Consultant or An Agency? Thanks to the interest in this post, I’ve launched a paid service called Credo Porter to give you personalized consulting on what channels are best for your business and what type of marketer you should hire. Check it out! In my day to day of speaking with businesses and consultants, I’m confronted with the fact that a lot of businesses have no idea whether they actually need a consultant or an agency to fulfill their needs. Here’s the deal – I’m a consultant myself. Every month I speak with 5-6 potential clients and many more who are looking for help. I only personally pitch about 2-3 a month, depending on whether or not I have open time in my personal consulting schedule to take on a new client. And when I pitch, I rarely lose. Incredibly rarely. This past week, I lost a contract because the business really needed an agency instead of a solo consultant. So I began thinking about the reasons why a business should hire an agency over a solo consultant, or vice versa. 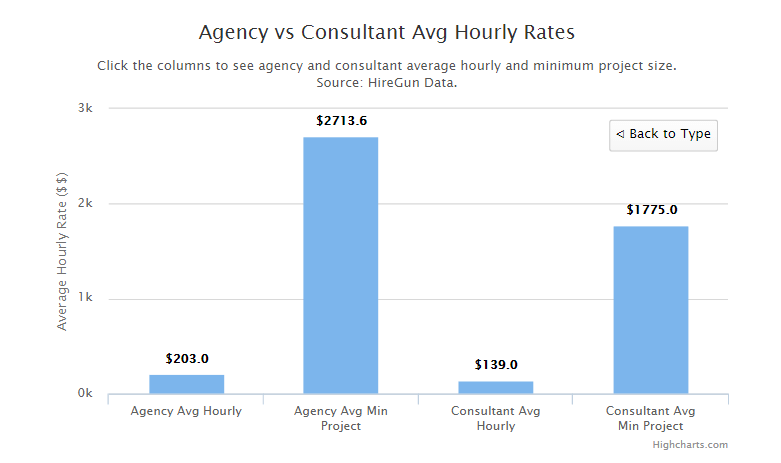 Here what I came up with – the reasons why you should hire an agency over a consultant. I’m often asked what the difference is between a consultant or an agency. This surprises me, though I have learned that many businesses have no idea what the difference is. Likely the confusion comes in the nomenclature. A consultant can be used to refer to someone who works for an agency and works with clients through that agency. In the Credo world, and in the ever-increasing world of people working for themselves, a consultant refers to a solo person not tied to a bigger organization. They work with their clients directly and are often able to be more embedded with their clients because they purposefully keep their workloads lighter. Consultants may have other individuals they work with, such as designers or developers, but they do not employ anyone else. Conversely, an agency is a larger organization that has multiple layers of people and services. They’ll often have account managers (some agencies have consultants doing both the account management and the actual work), strategists, individual contributors (in more service-oriented agencies), and more. They can operate at a scale that most individual consultants cannot, though this often comes at a higher price. In the marketing world, agencies are often the entities most able to provide services such as directly managing your social media accounts, implementing changes for your SEO strategy, or writing and promoting content to grow your brand. Some consultants are also able and willing to do this, preferring to be an individual contributor and an extension of your team, but in my experience this is less likely than with an agency. Consultants have the added challenges of running their own business, doing business development, managing contracts, managing multiple clients, and more. Unless they are able to bill at high enough of an hourly rate to still cover their non-billable time, most consultants will not be actively doing the work for their clients. If they scale outside of themselves, they are no longer just a consultant. If you need a company outside of your own to help with creating and executing on marketing strategies that involve multiple marketing channels, an agency is likely the better choice for you. An agency is more likely to have the multiple skills you need to run the different channels, unless they are a true generalist who has also managed to go deep in the specific areas that you need. One advantage of agencies is that you can potentially have access to multiple levels within the organization and therefore many more years of experience to pull from. If you’re assigned one consultant but are not quite sure on their work or what they are suggesting, you can always request to have their manager or another consultant pulled in on the project to give some clarity. Because most consultants take on fewer clients than agencies and do not have the benefit of other parts of a company to execute on work for them, a consultant is great to hire when you need someone to create a strategy for you that you then put to action internally using your own team. Consultants have often worked directly with a lot of different businesses and most have also worked inhouse, which means that they get what it takes to get things done and how to put together a strategy that your bosses will approve and let you do. What About A Lower Budget? As a business owner or marketing manager, how have you thought about hiring a consultant versus an agency? Is it even in your thought process when hiring? Great stuff John, the smaller the business – the bigger the confusion in my experience. As a Small Boutique Agency, we would straddle even your definition above but the premise is spot on. Especially agree on the value of multiple opinions, having a team to bounce ideas and challenges off us sure helps us give client value.